Fence and Railing Ranges-Better Products Co.
than wooden ones. These fence posts are easily assembled, eco friendly, renewable sources, rot proof, waterproof. We can manufacture various of fence posts according to customers’ detailed drawings. • Metal: High quality steel. • Length: 1m, 1.2m, 1.8m, 2.1m etc. • Shape: Square, round, rectangle. • Surface treatment: Powder coated, zinc plated, hot dip galvanized, painted. • Color: Green, white, black or as per customers' request. • Size: Available in any sizes according to your demands. • Used on the side of highway, railway and bridges as protection fence. • The terminal security of airport, Ports and quay. Steel Post for wood fencing is engineered to provide you with the strength of steel without sacrificing the natural beauty of wood. Constructed of structural steel with a heavy galvanized coating, this steel fence post can withstand high winds and heavy rain and will never rot or warp. We guarantee it - every steel post is backed by a 15-year limited warranty. We provide longevity and performance in a wood fence system which results in uncompromised value. • Made from recycled steel. 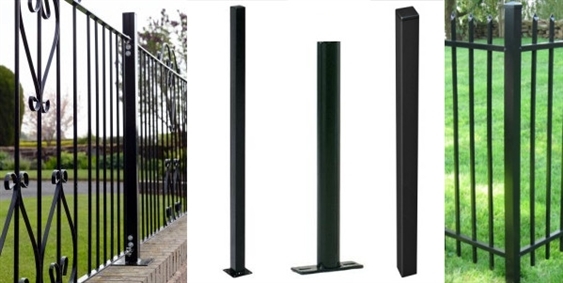 • This Steel Post is tall enough to be sunk at least 24″ below ground and reach your desired fence height. • Fence Boards in whatever style you like. A board at least 4″ wide is needed to fully cover the PostMaster from view. • Corner Clips for attaching the rails at the corners. • #8 x 1-1/4″ Truss Screws, available at most hardware stores. 6 screws for each rail. • #8 x 3/4″ Truss Screw, Available at most hardware stores. 4 per each corner post needing to be covered. • #12 x 1/2″ Hex Head Screws, available at most hardware stores. 4 per gate post. • Concrete for each fence post. • Gate Hardware: Hinges, Latches, and Drop Rods for each gate.